We’re so glad you’ve decided to straighten your teeth with braces. Not only because a straight smile looks better, but also because straight teeth are easier to clean. And clean teeth mean greater oral health as well as overall well-being, too. At Silver Creek Dentistry, Ripon orthodontist Dr. Frances Hamman will be able to help you choose between traditional metal braces or Invisalign clear braces. The system that is best for your occlusion will lead you to the straight smile you’ve always wanted. Metal braces with brackets and wires have been the gold standard of orthodontic treatment for many, many years. And there’s a good reason for that—they work! Traditional orthodontics are often the best solution when treating a number of different issues such as overcrowding, a cross bite, rotated teeth or wide gaps between teeth. With metal braces, Dr. Hamman bonds brackets to the facial side of your teeth. Then, the archwire is clipped into each bracket and held in place with elastic bands. Today, bands come in a rainbow of colors, so children, teens and adults can get creative with the appearance of their braces. The consistent pressure of the wire gradually moves your teeth into their proper alignment. Treatment time depends on the type of correction that’s needed, of course, but most people wear traditional braces for 12 to 24 months. Invisalign is another orthodontic system available from your orthodontist in Ripon. The difference between Invisalign and traditional braces is clear—literally. 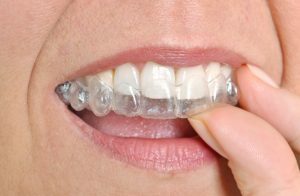 Invisalign uses a sequential series of clear plastic mouth trays to move your teeth. Aside from being almost unnoticeable when worn, Invisalign clear braces are removable. Thus, you’ll be able to brush and floss your teeth as usual and even eat whatever you like. Dr. Frances Hamman earned her Doctor of Dental Surgery from Creighton University in Omaha and then went on to earn a degree in orthodontics from Case Western Reserve University School of Dentistry. After working in her father’s orthodontics practice as a dental assistant during high school, college and dental school, she was practically destined to become an orthodontist. Dr. Hamman loves helping patients have smiles that are beautiful and straight, as well as properly functioning. Dr. Hamman served in the U.S. Navy at the Naval Hospital in Great Lakes, Illinois, and Yokosuka, Japan from 1997 to 2003. During this time, she was able to help patients of all ages who had many different orthodontic issues. To schedule an orthodontic consultation with Dr. Hamman at Silver Creek Dentistry, call our office today. We’ll be glad to achieve the smile of your dreams.